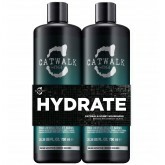 This specifically designed sulfate-free formula preps curls for styling. Rich marine botanicals of s..
Add strength, elasticity and smoothness without sacrificing hold. 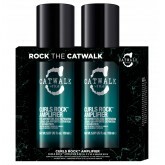 It's a necessary tool to create lo..
Buy one Curls Rock Ampllifier 5.1oz and get a second one for a special price!.. 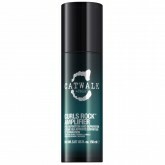 Provides hold and control for defined curls and streamlined waves by enhancing natural texture. Help..
Veil your hair in vibrance with this conditioner, which includes Aminoshield technology blended with..
Reignite brunette radiance with this indulgent mask, designed especially for warm hair tones and ble.. 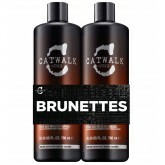 Illuminate and intensify bold brunettes with this colour enhancing shampoo, blended with horse chest..
Oh dear, another one bites the dust and falls victim to 'brown fade' syndrome! Fear not, you won't b.. 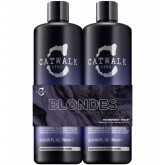 This sulfate-free shampoo enhances blonde shades and reduces brassy tone effects. With an illuminati.. 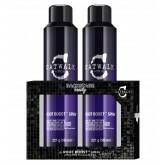 This great value TIGI Catwalk Fashionista Violet Tween Shampoo & Conditioner Duo contains: TI.. The perfect blow dry requires healthy looking hair, without rebellious split ends, This prepping emu..
Heat protection is vital for maintaining healthy, gorgeous hair. Care for your straight style with t.. 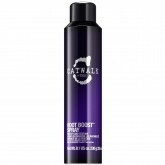 This intense conditioning formula helps you achieve beautifully smooth and glossy hair. Silk and Soy.. 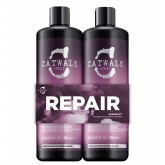 This reconstructing conditioner, with ingredients that penetrate the hair fibre, targets areas in mo.. 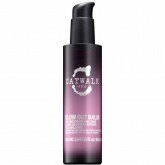 This reconstructing shampoo, with ingredients that penetrate the hair fibre, targets areas in most n..
Get ready for your close up with this TIGI Catwalk Headshot Duo. These two products will effectively..
A nourishing conditioner with a delicate oatmeal and honey fragrance. This formula, with acacia hone..
A nourishing shampoo with a delicate oatmeal and honey fragrance. This formula, with acacia honey, w.. 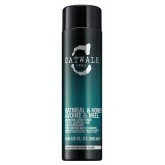 This great value TIGI Catwalk Oatmeal & Honey Nourishing Tween Shampoo & Conditioner Duo con..
For amazing lift and texture, fine mist foam delivers lift and support for long lasting, dramatic st..
For amazing lift and texture, this fine mist foam delivers the lift and support essential for a long..
Give a light pliable hold to the hair with this texturizing spray. 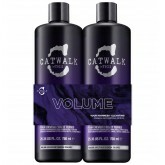 Its carefully designed formula al..
Includes the following Catwalk products for extreme volume and lift at the roots! 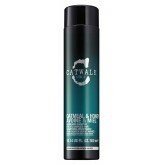 : Transforming D..
Lightweight spray formulated to refresh in-between washes. Adds lift and leaves hair with volume and..
Give your blow-out one more day! This translucent dry shampoo removes the oils that weigh your hair ..
Enhances volume and body while delivering weightless moisture. Helps defend against static and flywa.. 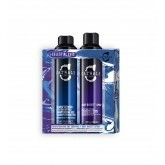 This elevating shampoo with anti-static polymers, adds volume while helping to prevent static and fl.. 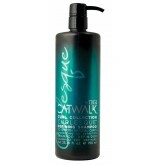 The TIGI Catwalk Your Highness Tween has been put together for people with flat hair that needs some.. 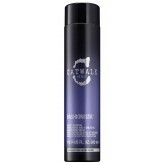 This sulfate-free conditioner enhances blonde shades and reduces brassy tone effects. With an illumi..
Prep it: a flawless, healthy looking foundation awaits. Reinvent frizzy, dull hair to achieve smooth..